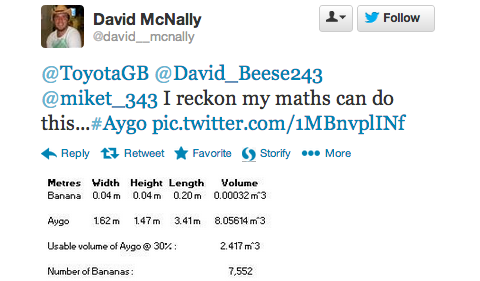 Published on March 26, 2013 in How many bananas fit in an Aygo? It would be interesting to know the answer please ? We’ll have a new blog post for you shortly with all the news from the Aygo Bananas story. In the meantime, you can find out the final figure on our Facebook page: http://www.facebook.com/toyotauk.